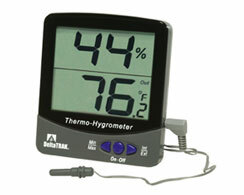 More about this process on our "HOME Page" or our "Water Damage" pages. Above, Burst washing machine line flooded part of this home. 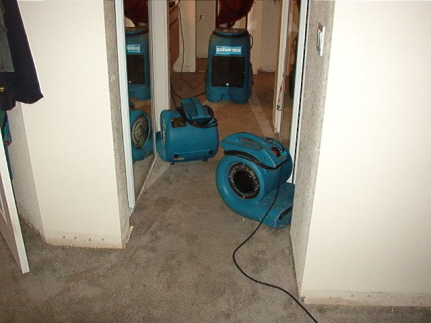 Drying carpeting, cement flooring and walls with a dehumidifier and 2 turbo air movers. ABOVE, Cracked toilet supply line flooded part of this home. Carpet padding has been removed, drying walls and carpet with 2 turbo air movers and a refrigerant dehumidifier. ABOVE, Burst, freshwater supply line caused this water damage. 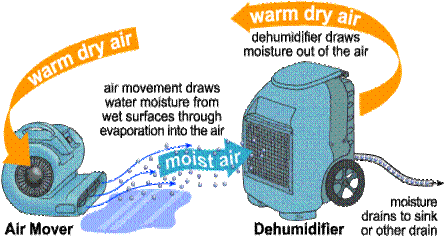 Drying walls by inserting tubes into the wall cavity and injecting dry air supplied by a low grain refrigerant dehumidifier. ABOVE, DRYING DOUBLE LAYERS OF SHEETROCK WITH COVERED WITH VINYL WALLPAPER. INJECTOR TUBES ARE INSERTED INTO THE WALL PUMPING DESERT DRY AIR INTO THE WALL CAVITIES UNTIL THEY TEST "DRY". ABOVE, Drying water damaged sub-flooring in a bathroom. 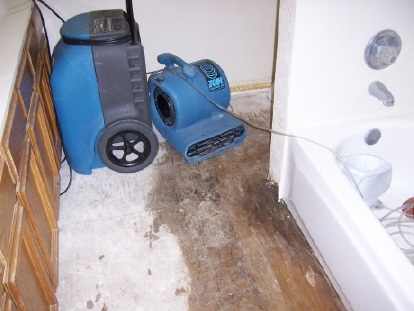 Water damage was caused by a leaky toilet supply line. The linoleum and underlayment had to be removed in this case to properly dry the plywood subflooring. 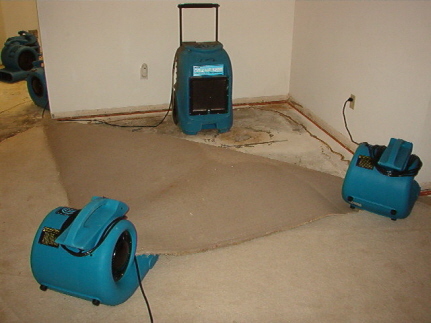 Equipment in picture: Dehumidifier, for removing excess moisture from the air and providing dry air to the area and a Turbo Air Mover, for providing rapid air flow across the surface of the water damaged area, greatly improving drying time. Above, Large Dessicant Dehumidifiers, used for Large Commercial Water Damage Jobs. Above, Ducting 1% Relative Humidity Air Into Large Commercial Building To "QUIKDRY" Carpet AND Drywall.